You’ll need two pans — a smaller one for the eggs, and one for the shrimp/spinach/etc. PAN #1: Add your diced garlic and a drizzle of olive oil into the larger pan and set it to medium heat. Once it’s hot, toss in the frozen shrimp. After a couple minutes, toss in a HUGE handful of fresh spinach. Mix it around until the spinach and shrimp are both cooked. Add in the parmesan cheese and diced tomatoes, and leave the pan on low heat to keep it warm while you cook the eggs. PAN #2: First, whisk two eggs and salt and pepper to taste, and pour them into a nonstick (or PAM sprayed) pan on medium high heat. To make an awesome omelet, once the bottom layer is mostly cooked, start lightly lifting up the edges of the egg, tilting the pan so that the uncooked liquid on top will end up traveling underneath the part you lifted up. Do this around the whole circle until all the egg is cooked. Now all you need to do is put the open omelet on a plate, plop the shrimp/spinach/tomato mixture on top, and fold over the egg! I was wanting to use up some leftover shrimp and my search brought up this recipe. I improvised a bit and added some green onion and bell pepper to the mix. Once the spinach was wilted I added the cooked shrimp. I added a bit of salsa to the eggs before cooking. 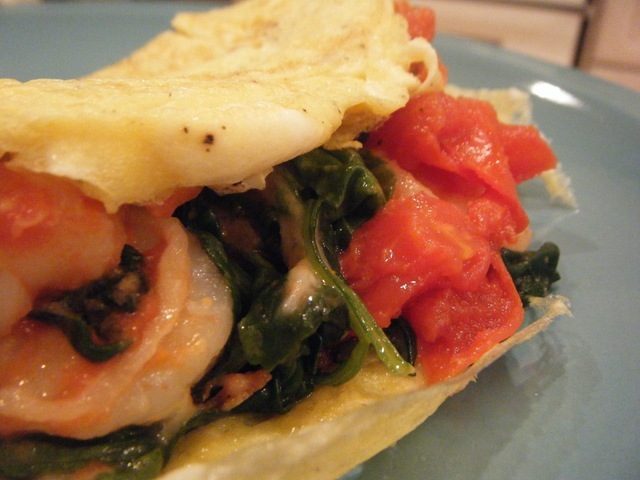 My husband and I really enjoyed this omelet, and we will use our leftover shrimp this way again.